It sure was --- you're a grandfather! I'm shocked it hatched, actually, due to my mismanagement. Now that I know (again!) what I'm doing wrong, I'm going to have to get some more eggs from you and give it another shot. I told my RIR rooster he was a father but he didn't seem impressed. 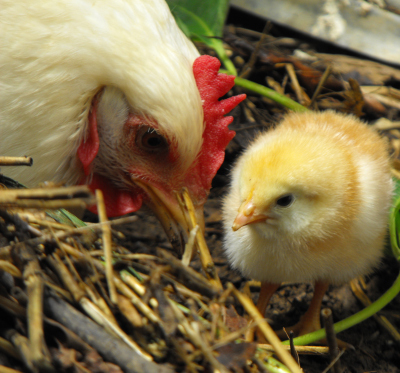 Do you separate your broody hen from the rest of the flock while she's sitting on eggs? And once they hatch, do you keep them separate? I had trouble with the other hens continuing to lay their eggs under my broody, so I separated her from them. I'm also worried about the other hens and roosters attacking the new chicks, so I'm not sure whether to integrate early or wait until they're more mature. Daddy --- he probably knew we were going to start asking for alimony shortly. Darren --- we put her in her own little space, mostly because we don't have a rooster so any eggs the other chickens lay under her would be wasted. 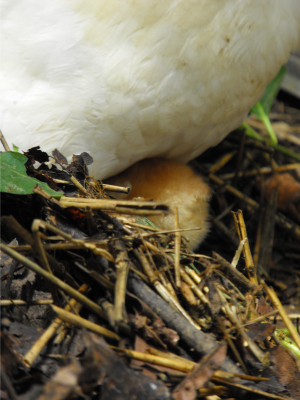 Plus, I've read that when other hens try to lay in the brood nest, eggs often get broken in the scuffle. We've got a low enough success rate already! As for integration --- I'm going to wait until they're much larger. Actually, Mark's going to give them a forest pasture section this week so that they can have room to roam without encountering bigger chickens. The mother hen is already the lowest on the totem pole, so I don't like the thought of her trying to defend her chick.